Anyone who has survived one Toronto winter knows how bitter cold the temperatures can get here. Many problems are born out of these freezing digits; stalled vehicles and high heating bills are just the start. However, there is one in particular that we here at Brothers always pay close attention to when Autumn ends, and that is frozen plumbing lines. To better understand how your home or office’s pipes can go from running perfectly fine to stopping dead in their tracks, it helps to remember basic physics. Water is inside your plumbing lines at all times, and its temperature is regulated by various components (such as a hot water heater, faucet valves, etc.). In the event that your exposed residential or commercial pipes are not adequately insulated with thermal wrap, the water could turn into ice on a very cold day or night. As we all know, the natural result of a liquid converting into a solid typically means an increase in pressure. Therefore, not only will your water cease to flow, it will also put undue wear and tear on the pipes themselves. Pipe bursting can occur in severe cases, and is by no means a pretty picture. If you thought dealing with a water leak in the summer was bad, imagine fixing one in the dead of winter! Fortunately, residents in Toronto need not worry about the difficulties of thawing frozen water lines or replacing those that have met their end, as the crew at Brothers is ready to serve them when the time comes. Although we are a general, all-purpose plumbing company, the region we provide service in naturally calls for our team to specialize in frozen pipe repair. Brothers has been helping GTA residents remedy their frozen and burst water line woes for almost four decades; we are experts in the field and run a crew of highly trained technicians that know how best to deal with these common plumbing problems. Keep in mind that no pipe is safe from the certain temperature and wind chill combinations, regardless of its material type. 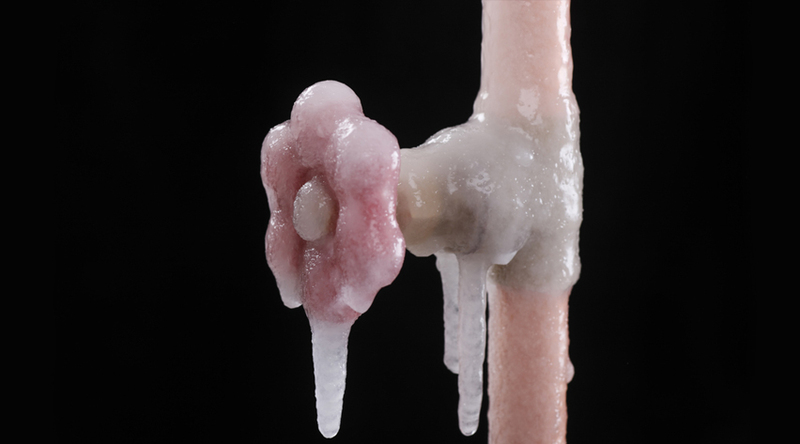 Copper, steel, and PVC are all susceptible to freezing and bursting; contrary to what many people think, the latter rarely involves an explosion of sorts. Even the slightest crack or crevice in a pipe can lead to catastrophic flooding, to the tune of 250 gallons a day! The best thing you can do before help arrives from Brothers is turning off your building’s main water shut off valve and begin using a hair dryer or other heating source to thaw the frozen line. Given the state of emergency, we will promptly dispatch a technician as soon as the service call is placed. Slow flow is the tell tale sign that pipe freezing is in effect; call the crew at Brothers immediately if you notice this.